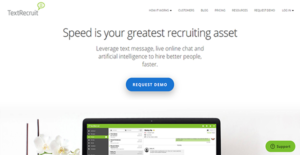 TextRecruit is an all-around recruitment, hiring, and employee management software that aids you from talent sourcing and employee onboarding to employee scheduling and distributed teams collaboration. It can integrate seamlessly into your existing recruitment workflows, thus your employees can adopt with minimal to zero process interruption. With TextRecruit, you can even leverage the power of SMS and live chat. You can automate exchanges with potential employees over text, as they can receive job information by sending a message to your assigned shortcodes. More than that, the solution aids you in providing on-demand support via live chat to assure future talents that they are going to work with a great company. Moreover, TextRecruit extends its functionality to employee onboarding, scheduling, and engagement. Plus, it enables you to keep your dispersed team members on the loop to create a more cohesive working environment. TextRecruit assists you in engaging with talents effectively by leveraging the power of text messaging. This means that you can automate your campaigns with canned responses to save your recruiters time. On top of that, your hiring managers can easily personalize messages to create better rapport with candidates. Long-form applications are objects of yesterday with TextRecruit. That is because the solution lets applicants express their interest in open positions through text. They can simply send a keyword to any of your recruitment shortcodes to receive instructions on how to proceed. This way, your hiring staff can process more applications within a short period. Your HR department has an efficient assistant with TextRecruit’s AI engine. This chatbot is powered by natural language processing and machine learning for natural engagements with potential hires. It is capable of screening applicants to see if they meet the minimum requirements for your recruiters to focus only on qualified candidates. Additionally, it can help you schedule interviews with talents, as it can integrate with candidate and employee data. Phone calls, video calls, and face-to-face interviews do not have to be your only means of engaging potential candidates. With TextRecruit, you can provide on-demand support that lets your chatbot or employees answer questions. This way, you can increase your conversions and inspire confidence in your company. TextRecruit helps you make sure that new hires do not miss their onboarding appointments. Its onboarding module sends the time and date to recently recruited talents and provides them with a link to Google Maps directions. On top of that, you can use this tool to make new employees aware of what they can expect on their first day. TextRecruit can also be utilized for in-house communications. You can foster better collaboration between teammates and different departments. On top of that, this helps your company remain organized with message broadcasts. To streamline your processes further, TextRecruit can attach itself to a popular web browser. By using the solution’s Chrome extension, your staff can engage talents directly from the browser. This makes them more efficient as they no longer have to switch between screens to communicate and do other tasks. If you are interested in TextRecruit it could also be beneficial to examine other subcategories of Best Applicant Tracking Software listed in our base of B2B software reviews. Since each organization has particular business needs, it is advisable for them to refrain from looking for a one-size-fits-all ideal software application. Needless to say, it would be useless to try to find such a system even among widely used software solutions. The clever thing to do would be to jot down the various essential elements that need consideration such as key features, finances, skill levels of employees, company size etc. Then, you should do your groundwork thoroughly. Read some TextRecruit reviews and look into each of the other solutions in your shortlist in detail. Such comprehensive homework can make sure you weed out ill-fitting platforms and choose the solution that offers all the aspects you require for business success. How Much Does TextRecruit Cost? We realize that when you make a decision to buy HR Software it’s important not only to see how experts evaluate it in their reviews, but also to find out if the real people and companies that buy it are actually satisfied with the product. That’s why we’ve created our behavior-based Customer Satisfaction Algorithm™ that gathers customer reviews, comments and TextRecruit reviews across a wide range of social media sites. The data is then presented in an easy to digest form showing how many people had positive and negative experience with TextRecruit. With that information at hand you should be equipped to make an informed buying decision that you won’t regret. What are TextRecruit pricing details? What integrations are available for TextRecruit?